Dr. Hamed Samarghandi is an Assistant Professor of Finance and Management Science whose research focuses on optimization and operations management. 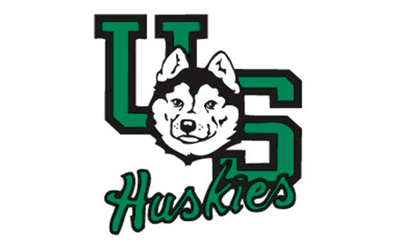 It should come as no surprise that future accountant Colby Harmsworth is always one of the most accountable players on the ice for the University of Saskatchewan Huskie men's hockey team. 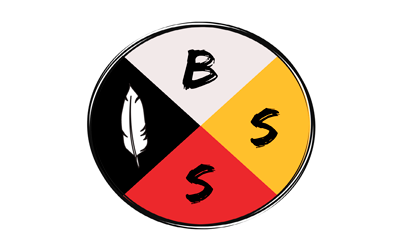 The Indigenous Business Students Society (IBSS) hosted the inaugural IBSS Networking Gala on March 7. Edwards School of Business celebrates International Women's Day. Regan Schmidt is an Associate Professor of Accounting whose research focuses on accounting professionals' judgment and decision making using experimental methods. Enactus University of Saskatchewan students hosted the 13th annual Indigenous Youth Idea Challenge on February 13. Edwards School of Business and Dorset College signed an agreement that allows Dorset business students to transfer to the Bachelor of Commerce program. Students and industry professionals gathered on February 7 to hear Dr. David Zhang's research on the marketing of GMO foods. Edwards School of Business signed memorandum of understanding with Cumberland College, Great Plains College, North West College, Northlands College, and Parkland College. Edwards School of Business Co-operative Education Program welcomed its 13th cohort on February 8 with a record number of 160 students. Three Edwards School of Business students received awards a part of Indigenous Achievement Week (February 4-8th). The inaugural recipients of the Get a Bigger Wagon Young Entrepreneur Awards were recognized as part of the 12th Annual Gordon and Maureen Haddock Entrepreneurial Speaker Series in January. Dr. Erica Carleton is an Assistant Professor of Human Resources and Organizational Behaviour whose primary research focus is on leadership and intersecting interests in employee health and well-being, sleep, and gender. The Edwards School of Business JDC West team took part in the annual regional competition taking home five awards. 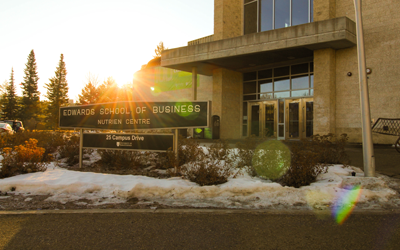 Graduating Edwards School of Business student Andrea Landstad will receive her commerce degree at USask Spring Convocation in June. Vince Bruni-Bossio is the Director of the Edwards Experiential Learning Initiative (EELI), Grandey scholar and an Associate Professor of Management and Marketing at the Edwards School of Business. His research focuses on board strategies and decision-making on regional and corporate boards. Dr. Megan Walsh is an Assistant Professor of Human Resources and Organizational Behaviour whose research focuses on leadership, well-being, gender and mindfulness. 3 amazing female leaders took the stage at the sold out Women of Influence breakfast presentation. A new radio show on CFCR 90.5 FM, produced and hosted by two former Edwards students, hopes to bring immigrant voices and live music to the airwaves of Saskatoon. Dr. Barbara Phillips, Marketing Professor and Rawlco Editor, researches visual images in advertising and how they communicate with the consumer. For Gabrielle Scrimshaw (B.Comm. '10), reconciliation isn't a destination. It's a generational process. Dr. Marjorie Delbaere is exploring the interplay between the persuasive use of language and images, and consumer knowledge transfer in the marketing of controversial products such as prescription drugs. Dr. Joseph Schmidt is an Associate Professor of Human Resources and Organizational Behaviour at the Edwards School of Business whose research is comprised of two main streams. The school has recently launched a research website to highlight our faculty's diverse research initiatives and to invite potential partners. The Edwards School of Business Co-op Program is on full display on campus this year with four departments hosting placements anywhere between eight and 12 months for students. Cierra Sieben-Chuback (B.Comm. '18) appeared in a profile on CBC's The National. The "Building Northern Capacity through Aboriginal Entrepreneurship: A Canadian Scandinavian Comparative Study" is a community-based, five-year project initiated in 2012 funded by the Social Sciences and Humanities Research Council (SSHRC). Jack Neumann has received the capstone to his legendary career at the University of Calgary. 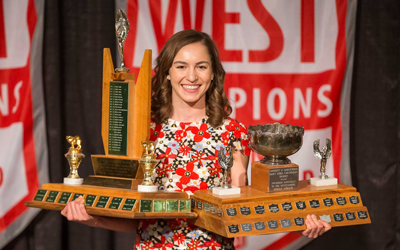 Enactus University of Saskatchewan president Dani Nichols was named Canadian Student Leader of the Year. Keith Willoughby has never been more disappointed to have been right, than he was last year. Congratulations to Brent Wellman, Director, Edwards Career Services on receiving the 2017 Safety Recognition Award. Gabrielle Scrimshaw '18 is a Gleitsman Fellow at the Harvard Kennedy School. The first in her family to attend college, she plans to start an investment firm for tribal businesses and indigenous entrepreneurs. 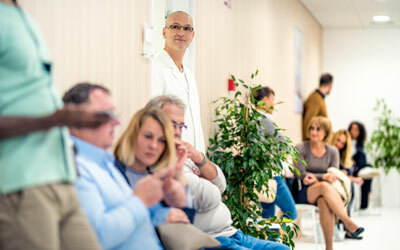 Edwards is celebrating the sixth anniversary of the labour-management relations certificate program. In April Enactus U of S unveiled a new tool for their Food for the Future program, a hydroponic system. Students, faculty and community members gathered to hear local entrepreneur, John Williams, share his evolving story. A group of 20 U of S students travelled to Calgary, Alberta to participate in the Enactus Canada Regional Exposition. The second annual Science of Marketing Pub Talk featured Dr. Marjorie Delbaere's research behind marketing a controversial product. 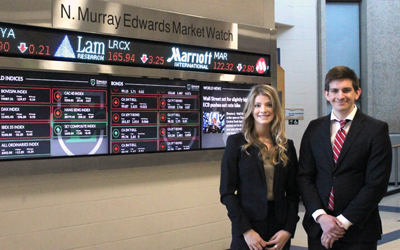 Dembroski student-managed portfolio hosts guest speakers from PrairieSky Royalty Ltd.
Students from the Edwards School of Business brought home two coveted titles at the 2018 JDC West competition, held at the University of Calgary. Edwards School of Business has partnered with PowHERhouse Media to deliver a timely executive learning program for female leaders called SPEAK! Canada. A team of four MBA candidates from Edwards School of Business took home 4th place in strategy at the 2018 MBA games in Ottawa, Ontario. The Master of Professional Accounting (MPAcc) program has achieved further accreditation by CPA Canada to deliver Capstone 2 module beginning in summer 2018. Earlier this fall Merlis Belsher and Vicki McDougall were honoured at the CPA SK Member Recognition Gala. With the first snowfall of the year out of the way and weather predicted to be in the minus, 46 brave Edwards students will host their annual Chillin' for Charity event Thursday at the University of Saskatchewan. Teams of students from around the world came together in Saskatoon, SK to compete for top honours in the fifth annual World Mining Competition. 2017 Convocation profile on B.Comm. graduate Anna Tavares. Edwards is encouraging Commerce alumni to join the Commerce Cheer Zone by offering a complimentary game ticket and food voucher for several Huskie games. Associate Dean Chelsea Willness has been appointed the new chair of the President's Sustainability Council. Current and former co-op students and employers attended a special event at Prairieland Park to celebrate the success of the program over the past decade. Brian Towriss (BComm'78) will be among those receiving University of Saskatchewan Alumni Association Achievement Awards at a gala on Oct. 26, 2017. As students started the new school year last week, Edwards officially launched its centennial celebrations as part of the third annual Alumni Jubilee. The Edwards School of Business at the University of Saskatchewan (U of S) will officially unveil the Allsopp Learning Lab-the first of its kind in the world-during a grand opening event on September 7. The Edwards School of Business, SuccessionMatching and a number of industry leaders have partnered to help university students and alumni successfully transition into business ownership. Four long serving faculty and staff were celebrated for 25 years of commitment and service to the University of Saskatchewan. Gabrielle Scrimshaw (BComm'10) penned an Op-Ed piece for the New York Times. Alumnus Chief Darcy Bear (BUSADM 2009) and Betty-Ann Heggie, friend, and donor of the business school were among Saskatoon's inductees at the award ceremony. Earlier this month we celebrated over 350 graduates at 2017 spring convocation. 2017 Convocation profile on B.Comm. graduate Rashid Ahmed. National experts share insights into organizational decision making at the 2017 Leadership Conference on Evidence-Based Decision Making. Last week Aboriginal youth from around the province met in Saskatoon for the second Annual Saskatchewan Aboriginal Youth Entrepreneurship Program (AYEP) gathering. The Enactus U of S team has been awarded the 2017 HSBC Indigenous Advancement Project Partnership Best Project award by Enactus Canada. 2017 Convocation profile on soon to be graduate Bailey Delainey. Project and award highlights from the 2016-17 Enactus U of S student team. Robert Gordon (BComm'70) visited students in the MBA program and hosted a workshop on business strategy. Robbin Rempel, David Fortosky, Zhijun Liu, and Ryley Dalshaug represented the University of Saskatchewan at the inaugural competition. Edwards faculty and students received 6 awards at the the University of Saskatchewan Students' Union (USSU) 25th annual Experience in Excellence Awards. Murad Al-Katib (BComm'94) has been awarded an international award by Nobel laureates. Kendra Wack, Ashley Dekok, Brittany Melnyk, and Timothy Tong represented the University of Saskatchewan at the third annual case competition. Co-founders Bryan McCrea and Evan Willoughby spoke to students, staff and the community about entrepreneurship on Thursday, March 16th. PrairieSky Royalty Ltd. Makes Investment in the Student Managed Portfolio Trust at Edwards. The Dembroski Student Managed Portfolio Trust, a student-run investment portfolio at Edwards School of Business, has received a $250,000 gift to boost the value of the portfolio. The three-day business case competition took place at the University of Alberta this January and was themed "Empower New Beginnings". The first ever "Break Room" was hosted by the Edwards Alumni Network during the December final season providing fun, food, and coffee for students. We are pleased to announce the winners of the COMM 119 business case competition and Golden Tongue Awards. Saskatchewan-based businessman, Murad Al-Katib, CEO of AGT Foods has been named Canada's 'Entrepreneur of the Year'. We catch up with new graduate Dana Carriere (MBA'16). The sold out event hosted 395 members of the business community and students in celebration of women leadership and achievements. Thanks to the generosity of U of S donors through the Annual Campaign for Students, Labach's rigorous but rewarding schedule is not compromised by cost. More than 2,700 students taking 20 courses will avoid the cost of buying a traditional textbook thanks to instructors choosing to use open textbooks. Keith Willoughby has been appointed dean of Edwards School of Business effective July 1, 2016. What started as a summer student position has quickly grown into something much larger for Lenny Williams, a fourth-year accounting student in the Edwards School of Business. For the 28th year, the Edwards School of Business has helped low-income individuals and families file their tax returns. Saskatchewan Polytechnic and the University of Saskatchewan's (U of S) Edwards School of Business signed an agreement today that allows business students to transfer between institutions. Daphne Taras wants to put a stop to filler words. She came up created the Golden Tongue Award. The award is given to first year business students who can give a presentation for more than five minutes without using filler words or relying on a written script. A sold out crowd of 395 members of the business community and students attended the celebration of women leadership and achievements. Edwards announces George S. Dembroski Student Managed Portfolio Trust has a current value of close to $1.4 million. Joe Schmidt's research featured in article about Football and how personalities can affect outcomes both on the field and off. Edwards School of Business was pleased to host the 2015 Leadership Conference on Wednesday, March 18th. The winning project is the Aboriginal Youth Idea Challenge; a program that offers aspiring Aboriginal Entrepreneurs six workshops to develop the skills to create a successful business plan. Four Edwards students took part in the Supply Chain Management Association of Canada's annual case competition and placed second in the national round. 5 students from Edwards are giving up the comfort of their homes to sleep outside for 5 nights to raise awareness of homelessness in the Saskatoon community. Schwartz, a 1950 graduate of the College of Commerce, has made the largest Inuit and First Nations sculpture donation in the university's history in the hope the work will inspire students in the school.